Two separate couples worlds apart. One couple lives in a private gated community in Phoenix, Arizona while the other struggles for survival on Chicago’s turbulent South Side. However, both couples have their worlds torn apart by a malevolent but impartial killer, Cancer. Each couple suffers the death of a long time spouse. Their heartbreak is immeasurable. Elizabeth uses alcohol to cope with the death of her husband, drowning her sorrow and grief in bottle after bottle of vodka. While, across the country, Frank turns to work, putting in long unnecessary hours in order to avoid going home to the dust covered and empty house he once shared with his wife. 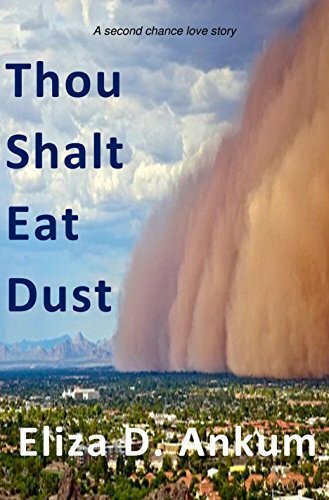 While on a business trip to Phoenix, Frank spots a beautiful woman in need of rescue during a rare dust storm known as a Haboob. Their chance meeting ends in what Elizabeth thinks is a one-night stand. But fate has conspired to bring this widow and widower together in order to right a long delayed injustice. Because they have more in common than the death of a spouse and a chance meeting on a Phoenix street. They share a violent and murderous past. Join Eliza as she weaves the death of a child in 1960 Centralia, Illinois with the turbulent 1968 Chicago riots, that occurred after the assignation of Martin Luther King Jr., into a sweeping romance story for today’s readers.